Ongoing global warming not only involves changes in temperature and the global mean; it affects more or less every part of the climate. Regional temperature changes are often greater or smaller than corresponding changes in the global mean. In some cases the direction of change may also be different. For example, temperature changes are higher over land than over the ocean. Precipitation increases in some regions but decreases in others. Changes in extreme events may differ from changes in the corresponding mean. Present scientific knowledge clearly indicates that the already observed global trend towards warmer conditions will continue and that it will be accompanied by changes in yet other aspects of climate. 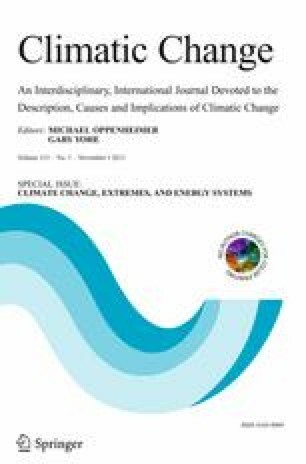 This paper highlights, as a brief review, aspects of our changing climate from the available scientific knowledge with a bearing on the energy sector. Its focus is on temperature and precipitation, with some consideration of wind and sea level, among others. While uncertainties remain as far as the magnitude of future global-scale changes is concerned, and even more so their many regional patterns, significant changes are foreseen in, for example, global and regional temperature and precipitation, sea level rise, and in the characteristics of various extreme events. This review contributes to the research efforts within the strategic research area MERGE at Lund University and within the Mistra-SWECIA research programme funded by the Foundation for Strategic Environmental Research. Jouni Räisänen (University of Helsinki, Finland) has kindly provided Fig. 2.